Get ready to give thanks in style. Make a good first impression with these creative table settings ideas for Thanksgiving feast from Marta Stewart. A Thanksgiving table doesn’t have to be over the top to be beautiful and small stylish and creative details can make a big impact. For a chic fall table, try combining traditional and trendy pieces. Choose a natural theme for seasonal linens and decorations you craft yourself and don’t be afraid to mix textures and patterns. Adorn your table with autumn’s accessories like vivid fall leaves, assortment of flowers, foliage, and fruit to create a custom centerpiece in fall colors. Use matching ribbon for everything or pick a few contrasting colors. Creative handsome place-card gobblers can also add a burst of holiday cheer. 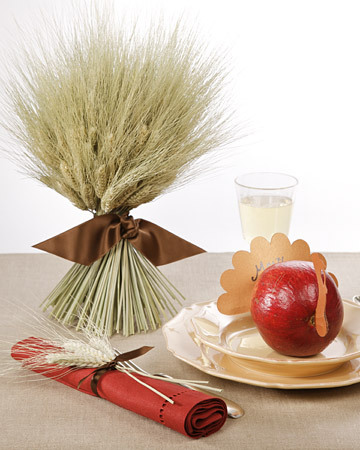 Check out these photos of beautiful Thanksgiving table settings, centerpieces and accessories for ideas and inspiration. Happy Thanksgiving, all!